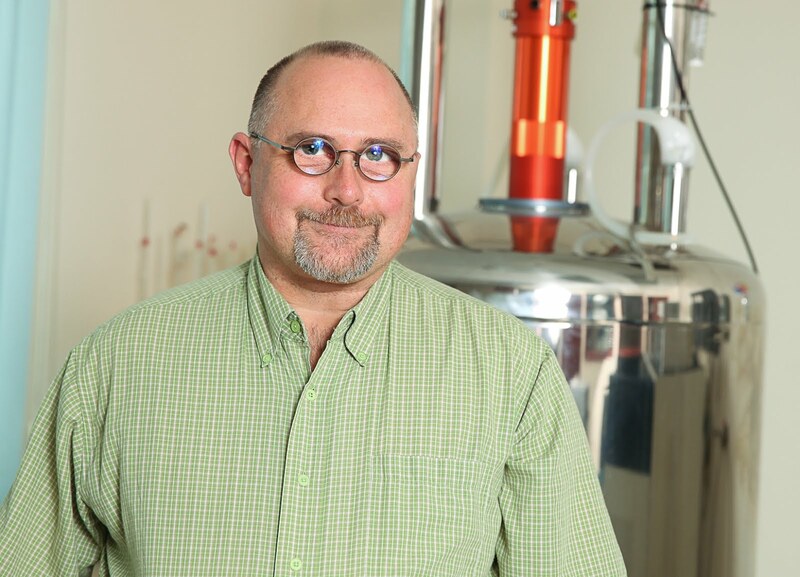 University of Ottawa NMR Facility Blog: How Can I Get a Quantitative 13C NMR Spectrum? How Can I Get a Quantitative 13C NMR Spectrum? 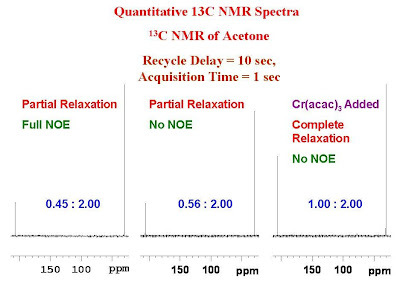 With conventional acquisition parameters, 13C NMR spectra of liquids are rarely quantitative and usually not integrated. There are two main reasons for this. Proton decoupling is normally used to simplify the spectrum and as a way to build up sensitivity as a result of the nuclear Overhauser effect. Also, typical T1's for 13C are very long. One can still get quantitative data and a proton decoupled spectrum if a very long recycle delay (perhaps 5 minutes) is used and the 1H decoupling is applied only during the acquisition time which is very short with respect to the recycle delay. Using such parameters however makes the collection of data prohibitively time consuming. To avoid this problem, you can add a paramagnetic relaxation agent to the sample to reduce the relaxation times. In the spectra below the data were collected with a 10 second recycle delay. In the left hand spectrum, the duty cycle of the decoupler was 100 % and the spectrum exhibits an NOE. In the middle spectrum, the NOE is greatly reduced by decoupling only during the acquisition time (decoupling duty cycle = 10 %), however the long T1's prevent the spectrum from being quantitative. The spectrum on the right was acquired similar to that of the one in the middle except some Cr(acac)3 was added to the sample to reduce the relaxation times for the carbons. This spectrum is quantitative. Is there a rule-of-thumb for the molar quantity of paramagnetic reagent required? If not, how would you suggest one optimise the reagent use - add 5 mg and run a 1-scan acquisition, repeating as necessary? According to Stefan Berger and Siegmar Braun in "2oo and More NMR Experiments" p.318, the appropriate amount of Cr(acac)3 to use is 0.1M or 35 mg in 1 ml of solution. Hi Glenn do you think it is possible to get a quantitative 13C spectrum from by a BBI probe (internal coil for 1H snd external coil for 13C)? Thank you for your question. Yes it is possible in the same way it is possible with a standard broadband probe as long as the T1's and NOE's are respected. The only difference is that you will have less sensitivity compared to a standard broadband probe due to the smaller filling factor. My sample contain all protonated carbons. the T1 for protonated carbons are about 2.5 seconds. Is there a relationship between T1 of the carbon and the length of the period not to decouple (for NOE to dissipate) in order to be quantitative? Thank you for your question. The NOE's decay at the 13C T1 therefore you should leave at least 5*T1 without decoupling between scans. If you are willing to put a bit of paramagnetic relaxation agent in your sample, you will shorten the T1 and also reduce the dipolar contribution to the relaxation allowing you to use shorter delays and get more quantitative results. Dear Glenn, what is the effect of heating the NMR sample containing the compound of interest and Cr(acac)3 as the relaxation agent? The relaxation rate for a spin, 1/2 nuclide influenced by a paramagnetic agent depends on the the square of the local field which in tern depends on the total spin, S and the reciprocal 6th power of the average distance between the unpaired electron and the spin. I would not expect this term to vary much with temperature. The relaxation rate also depends on a correlation function which in tern depends on the correlation time in a Lorentzian manner. As the temperature is increased, the correlation time becomes shorter. For molecules in the extreme narrowing limit (small molecules) this means that the relaxation becomes less efficient and the T1 relaxation time therefore gets longer. Relatively compare, 1H nuclei is more sensitive than other nuclei as it is more abundant nucei. What are the other factors that affect sensitivity aspects, except natural abundance ? For example, some nuclei are less sensitive although their natural abundance appreciably good ? Please clarify my doubt regarding this aspect..
Aside from the natural abundance, one must also consider the gyromagnetic ratio, spin number, relaxation properties and line widths when considering sensitivity. How does the paramagnetic agent do for T2 relaxation? Do you worry about line broadening? Thanks! Yes of course the addition of a paramagnetic material will also shorten T2 and as a result broaden out the NMR lines. One would have to experiment with different quantities of paramagnetic material to determine how much broadening could be tolerated. Stefan Berger and Siegmar Braun suggest using 0.1M Cr AcAc in "200 and More NMR EXperiments".